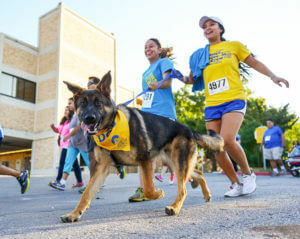 Almost 900 people attended St. Mary’s University’s first-ever 5K run/walk – the StMU 5K for the Neighborhood – Sunday, Oct. 19, on campus. The event was part of an ongoing effort to enhance quality of life through neighborhood revitalization. St. Mary’s strives to be a vital partner in promoting the health and wellness, education and safety of the Gateway District community. St. Mary’s students’ registration fees will go to United Way agencies operating in the revitalization area. All other entry fees will support a partnership with SNIPSA to promote neighborhood safety and animal care by spaying or neutering dogs in the area. At a recent service event, University President Thomas Mengler told about 750 students, alumni, faculty and staff that he’d take the ice bucket challenge if they’d run the 5K. Because more than 500 people participated, he and his wife, Mona, will make a personal donation of $5,000 to United Way. When: Sunday, Oct. 19, 2014. Opening remarks at 8:45. 5K begins at 9 a.m.
Why: Raise funds for United Way and raise awareness of spay-neuter programs. Members of the community surrounding St. Mary’s also participated, and they brought their spayed or neutered dogs, who received a free “Gateway Dog” bandanna! The St. Mary’s University Neighborhood Revitalization Project< was established in 2007. Together with neighbors, business proprietors and the City of San Antonio, the University has focused on commercial transformation, housing rehabilitation, education, and infrastructure and quality-of-life improvements. There are new pocket parks, street signs, bus stops, bike lanes, crosswalks and trees; improved sidewalks, streets, and business facades; and new construction of homes and a multifamily apartment complex.